This small mangrove pit viper (Trimeresurus purpureomaculatus) was prying for its lunch in between the supports of Bintan Resorts Mangrove Discovery jetty. From far it looks like a cobra, but the scales pattern on its head and the loreal pit between the eye and nostril distinguishes it from other snakes. Notice the beautiful skin with strongly keeled scales (click on the image to get a higher resolution one). I almost got difficulties as the 70-200 minimum focus distance of 1.2m was reached. Thank God, I never find something like this in Lagoi…..
Thanx. I pm you on your interest in Lagoi Bay. My name is Michael and I’m a student from the University of Pennsylvania in the United States. Could I ask you some questions about the ecology of Lagoi Bay? Ninik, tkyu, sekarang bisa kasih rating juga, hehe. Berapa panjang ularnya? 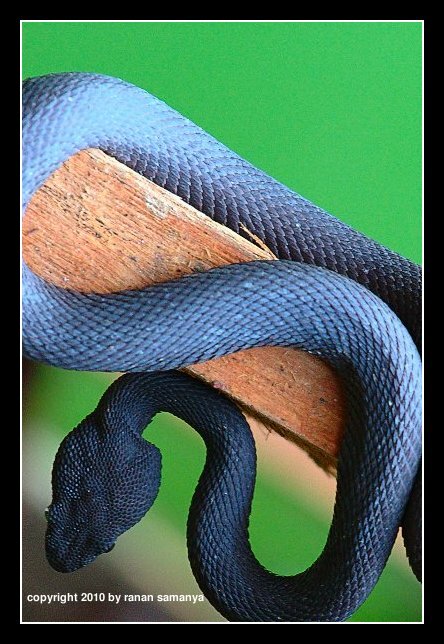 kalo liat kepalanya.. termasuk yg berbisa ya..
Mprit, semua pit-viper berbisa, termasuk yang ini. Panjangnya sekitar 1m.